There is a misconception in Colorado that most of the state's wineries are along the western slope in the Grand Valley. It is true that most of the vineyards are located there along with a critical mass of wineries, but almost half of the state's wineries are spread out along the Front Range between Fort Collins and Pueblo. The reason for this is simple: the Front Range is where the consumers are found. While not surrounded by picturesque vineyards as the wineries in the Grand Valley, these "urban" wineries are found in Quonset huts, industrial parks and even in quaint little mountain towns. If you live in Denver, you don't have far to go to find a winery producing world-class wine. And if you haven't had the pleasure yet of having a glass of local wine along with a plate of charcuterie while overlooking Bear Creek, I suggest you get up to Evergreen to visit with our guest this week, Michelle Cleveland. Growing up in a family that loved food, cherished its German roots, wine has always been an important part of my life. After graduating with a degree in Agriculture from the University of Illinois I began my adult venture into the world of wine. Beginning with a local winery in the Chicago suburbs, Lynfred Winery, I became a wine of the month member and there was no turning back! With so many fascinating varietals to discover, leading to vacations centered on visiting National Parks and searching out small wineries. In the mid 1990’s I fulfilled one of my lifelong dreams by moving to Colorado and was delighted to discover Colorado’s wine country. After attending the Colorado Mountain Winefest, I learned of a new winery opening in Evergreen. Soon I began a tradition of mountain hikes and lunch at Creekside Cellars. I admired owner Bill Donahue for his quiet spirit and love of wine. On one of my visits to Creekside I mentioned to Bill my interest in learning how to make wine. His encouragement was the spark I needed to pursue my second dream. I resigned as Director of Production and Distribution for Dazbog Coffee Company, and began volunteering at Creekside Cellars seeking all Bill had to offer as a teacher and mentor. Shortly thereafter I enrolled in the University of California Davis graduate certificate program in Enology and Viticulture taking my hands on knowledge to the next level. In addition to learning the winemaking process, I’ve had the opportunity to work in Creekside Cellars' vineyard, which I love as it takes me back to my roots in agriculture. 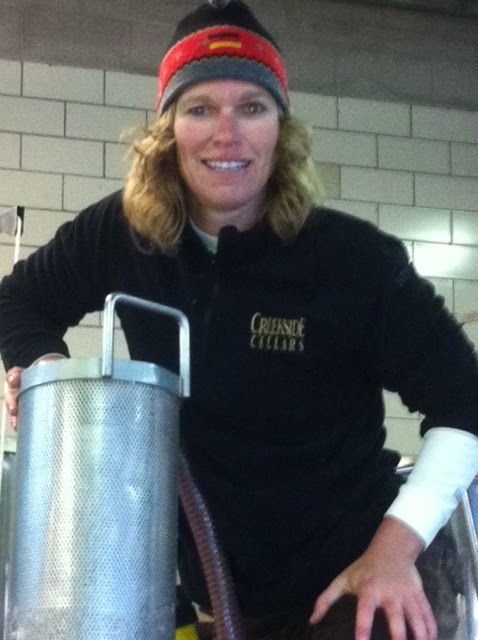 CWP: If you weren’t in the wine business where would you be working? Growing up in northern Illinois farm country definitely made an impression on my life. I grew up with Arabian horses, worked on a dairy and hog farm and always loved being outdoors no matter the temperature! Since I have always enjoyed the outdoors, I could see myself working on a vineyard or an olive grove. I love driving the tractor and getting my hands (and the rest of myself) dirty! Agriculture is very fulfilling. One of my reasons for moving to Colorado was to feed my hunger for outdoor recreation. I wouldn’t want to live anywhere else. I enjoy hiking and walking with my two black labs, biking, running competitively, downhill skiing, snowshoeing and of course trying as many different wines as possible. Drinking wine is educational for a winemaker! I love blending. I have yet to produce a Rhône white blend. CWP: If you could make wine in any of the regions in the world other than Colorado, where would you be making wine and why? Five years ago I would have chosen the Bordeaux region. Today, I would choose the southern Rhône region because of the opportunity to enhance my skill at blending. A Trockenbeerenauslese 1973 Pieroth, from my father’s wine cellar, celebrating my graduation from the University of Illinois, an unforgettable memory. CWP: To what style of music would compare your wine lineup? Sarah Brightman, whose music is multi-dimensional and a fusion of several musical genres. Creekside’s wines present themselves in a like manner using different varieties and incorporating old world and new world winemaking techniques. CWP: What do you think consumers should think of when they think of Colorado wine? An evolving and continually improving industry, with as much potential as any other wine region. CWP: Where do you see the Colorado wine industry in ten years? I would be delighted to see the industry drawing as much attention as Oregon and Washington. I would also hope to have educational opportunities in enology and viticulture available at a Colorado university. How many Colorado wines have you tasted and where can the industry improve?